Between its opening in May 1876 and closure in 1954, Mavisbank the Hospital, was served by at least nine different Superintendents. It seems that all the medical and administrative records have been lost, though who knows, perhaps one day some might turn up in family attic or, more likely, legal basement. Research for this manuscript has thrown up just one file covering Mavisbank Nursing Home Ltd between 1946 till 1953. The following account is derived from sources such as the Lancet, the British Psychological Association, the British Medical Journal, census returns, books, broadsides, and newspapers. The very first Superintendent to govern Mavisbank was Dr James Allan Philip. 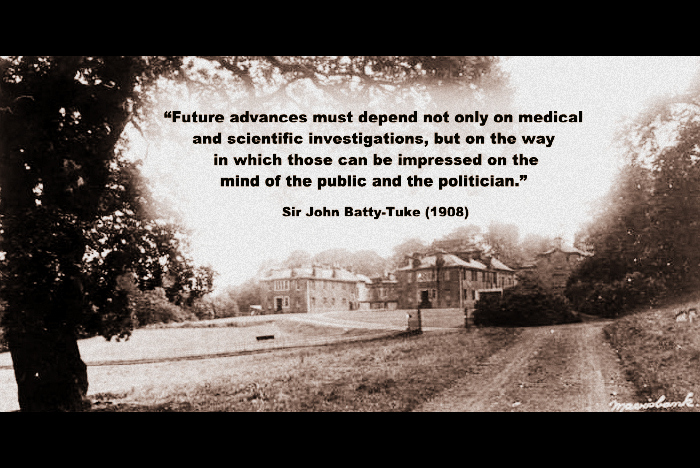 His appointment was a coup, as he was brought from the newly refurbished Lincoln Asylum. The Lincoln Asylum had been built in 1820 as a ’public receptacle for objects suffering under the greatest of all human calamities.’ It is now a conference centre called The Lawn. The first reference, amongst sparing few, to Allan Philip, is a letter he wrote to the Lancet, in response to an article on the treatment of Dipsomania. The letter was dated 24th August 1878, and Allan Philip signs off as Superintendent of Mavisbank Asylum. 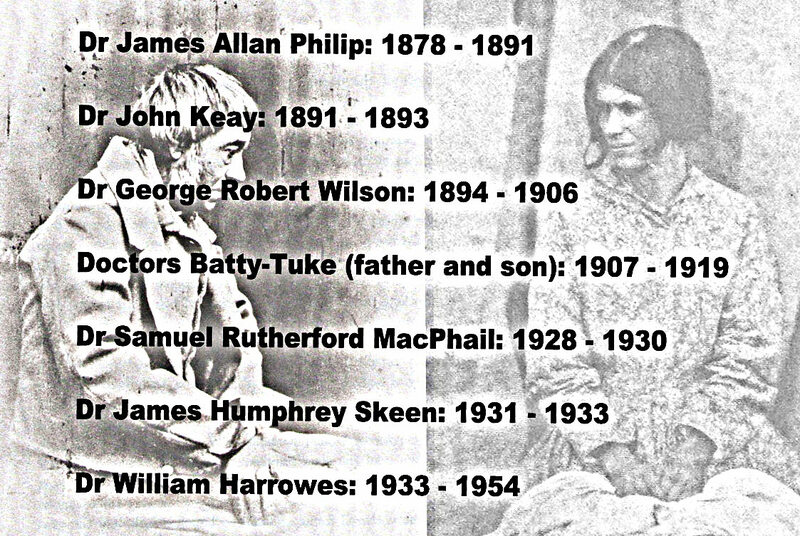 Elementary family investigation has revealed that Allan Philip was born in Aberdeen in November 1845, the eldest child of eight born to an Englishman who had settled in Mounthooly, Aberdeen as General Practitioner. Curiously this was the Aberdeen city district served by the writer’s wife also GP between 1993 and 2001. In 1880, in Turriff, Allan Phillip married the daughter of an Aberdeenshire minister: Katherine Cruickshank, and in June 1882, at Mavisbank, she was delivered of a daughter. Shortly after the young family move on from the auld Mansion House and institution and disappear from record. After this brief Mavisbank sojourn, Dr Keay moved on to be Superintendent of Bangour Village District Asylum, where he served out till retirement. When the First World War broke out he was entrusted with the task of converting Bangour into a 300 bed MilitaryHospital. His military bearing survives record: he was apparently unflappable, precise and unnerving in his administration and his pride in his hospital reflected in his belief that to ease suffering his staff must feel belonging and heartfelt support from their Superintendent. One nurse recorded Dr Keay’s only weakness: “an unconscious look in his eye, which signified his feeling that brass-hats would be so much more manageable if they were certified.” Dr Keay was awarded CBE and died in Dorset in January 1943 aged 83 years. The next Superintendent of Mavisbank was Dr George Robert Wilson, who served the Institution for the decade that spanned the century’s turn (from 1894 till 1906.) Sadly his life was cut short, aged just 42 years, by insidious breathlessness with mycoplasma concluding victory. This bacterium felled a giant, a man once vigorous in youth, when he had played rugby football for Scotland. His talent for sport had no limit: he was a scratch golfer, and as such is listed victorious, year after year in the British Medical Association Tournaments. He was also a fine curler and cricketer. A rather vivid impression has been left of Dr Wilson, surviving in his own words. In 1899 he wrote his most notable work: Clinical studies in Vice and insanity. This book is a rarity: for it carries personhood first and science second. Indeed it carries man, and the scientific misunderstandings of addiction, in a most timely reminder for today, when science alone has failed to combat Scotland’s exponential cirrhotic decline and the unenviable, yet undeniable statistic, as first place on Europe’s list of untimely deaths due to alchol. It would not be time wasted for the 15 cases of alcoholism described by Dr Wilson to be aired and left upon the collected consciousness of us today. Dr Wilson certainly disproves the dictum of this generation’s scientific tutors, who tell us that a single case (n=1), or indeed a handful of cases as here, carry no importance, as only statistics with massive demoninators, have any meaningful scientific relevance. Dr Wilson was a man of wide interest. His great-great-grandfather was none other than Robert Adam, half the ‘polish’d mind’ of Mavisbank and wholy of Britain beyond. There can be no doubt that it was this family association that tuned Dr Wilson’s ears to the beautiful but faint little mavis song. Having been born in Kilmaurs House in Duns, the son of a family of renowned weavers, Wilson appears to have shared in family suffering as his father was pensioned after serving for the Royal Artillery and his grandfather James Smith never the same after his life in the 20th Dragoon Guards. Wilson’s mother, riddled with tuberculosis, died after two years suffering in 1873, and poor Wilson was not even seven. What happens thereafter is not entirely clear, but in all likelihood he was raised by his mother’s brother, George Smith in Edinburgh. George was a religious man, well travelled, who was in his day considered a man of letters, a writer and publisher. One can assume he was popular as his writing brought him wealth. In 1891, we find Wilson living with his uncle in a mansion house in Newington, along with three other lodgers. All were doctors serving as supporting Physicians to Dr Clouston at Morningside’s Royal Edinburgh, apart for one, a pathologist to the Asylum. In 1893 the fifty-seventh annual meeting of the Medico-Psychological Association met in Edinburgh and one of the speakers was Dr Wilson, in advance of the book he had written, and was just about to publish, entitled simply: Drunkenness. How curious, in reading Wilson’s summation of 1893, in that his dark mirror reflects the views of today’s more acerbic medical commentator, Theodore Dalrymple, the monthly columnist in the British Medical Journal. Below are two case studies, given in Wilson’s own words but severely edited for this narrative: they are interesting on several accounts. Firstly for the vividness of life and the inescapable, complex, interaction of ‘drunkard,’ family and environment. Secondly, they reveal the house of healing that was Mavisbank, and the understanding, largely since lost, that natural environs, beautiful surroundings and a feeling of belonging can restore purpose when it has been lost to drink. His habit had got past the stage of concealment before his wife died, and more than once or twice she endured the pain of seeing her husband drunk beside her death-bed. When his wife died Andrew was drunk, for the next few days he was drunk, and he was drunk at her funeral. Then he came to us. But to him drunkenness was a sin, and nothing more and nothing less than a sin; and a due repentance was the only possible cure for it. It had been ordained by his relatives that Mavisbank was to be his wilderness, and his humility forbade him to rebel. He would eat of our locusts and clothe himself spiritually in camels’ hair, and in time he would be strong to fight his devil. Everything that was suggested he fell in with in a spirit of submission, except a very few things, like cards and dancing, which were against his conscience. He took the regulation walks within and without the grounds, he accepted the constant supervision of an attendant, he went to bed at ten and rose at half-past seven, he went to the drawing-room on the nights prescribed. He curled, and golfed, and played bowls, – all with the same cheerfulness and docility and repentings. One thing preyed constantly upon his mind and told against his recovery. He had been too drunk after his wife’s funeral to see that the grave was properly attended to or to remember whether it was or not. The idea of his neglect took on the nature of a delusion in his mind. And so, before many weeks had gone, he had drunk himself into the grave which he had been so eager to visit. Mr Erythema came to us under an assumed name, he quarrelled with us seriously within a fortnight, but he stayed on because he had paid to be treated, and he liked value for his money; and after four months he was discharged recovered with good results. These things were characteristic of the man. Secretive and a little sly, exacting and irritable, not afraid to speak his mind, very business-like and methodical, he had plenty backbone left, though drink had worn off the layers which make life pleasant. He had taken seriously to golf, and if any one thing can be said to have saved that man, golf must get the credit. He practised assiduously, first here and then on other greens, and he also did a great deal in exploiting all the places of interest in the county and beyond it. He roamed all over the countryside, taking prodigiously long walks; he planned all sorts of improvements in our household arrangements; he devised a new golf club and laid out our course on a new pattern; he tried to convert me on politics, went to the theatre, doctored the horse, called frequently upon friends whose acquaintance he had made since coming to us, and was altogether very busy and very cheerful. Figure 50: The writer’s father Stuart, with the writer’s son Andrew: like Dr Harrowes, Andrew saw beauty. Dr Wilson died at Allantown House, Newmains, Lanarkshire in March 1908, he was 41 years old and had only a few years before purchased the Mansion House to form his Sanatorium for the treatment of Neurasthenia and other mental disorders. He left behind a beautiful widow and two little daughters. Wilson, George R. (1899) Clinical Studies in Vice and Insanity; William F. Clay. BBC News (22 Feb 2009) Scotland has the eighth-highest level of alcohol consumption in the world, according to statistics analysed for the Scottish Government.